The lobby and staff were very helpful to us, when we arrived a little later in the evening. They even tried to help with tracking down the type of coffee I like to drink! Clean nice rooms. A simple breakfast toast,cereal etc. Waffle mix was a little runny not mixed well but not a big deal.Very quiet if you need something just ask they will try to help you out. We were on a mom and daughter trip and felt very safe there. You get what you pay for. Inexpensive room. Clean but definitely not “newly renovated” as the sign says outside. Prob won’t stay again. Where to find Neepawa hotels near an airport? 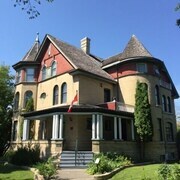 Where can I find hotels in Neepawa that are near tourist attractions? Are you after accommodation within a short driving distance of central Neepawa? Within a 0.1-kilometre (0.06-mile) radius of central Neepawa you'll find 3 Expedia-recommended hotels you can choose from. 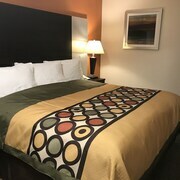 The Neepawa motel, is a great option for visitors due to the fact that it's it is the most centrally positioned accommodation choice in Neepawa. The Westway Inn Motel and the Neepawa motel are hotel options to investigate. 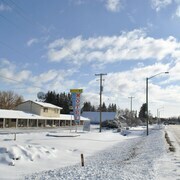 The Westway Inn Motel is positioned 1 kilometre (1 mile) from the heart of Neepawa. The Neepawa motel can be found 0.7 kilometres (0.4 miles) away. The Bay Hill Inns & Suites, Neepawa is one more alternative. It's located 2 kilometres (1 mile) from Neepawa's downtown. 55 kilometres (34 miles) from Neepawa you'll find Onanole, where you can spend a few hours exploring Poplar Ridge Golf Course and Lakewood Hills Golf Course. Some of our recommended Onanole hotel options are the Elkhorn Resort, Spa, & Conference Centre and Honeycomb Bed & Breakfast. Or, you could consider staying in Brandon, 55 kilometres (33 miles) to the southwest of Neepawa, where you can pick from the Best Western Plus Brandon Inn and Royal Oak Inn And Suites. While in Brandon, don't miss the Brandon University and Corral Centre. Just because you're on vacation, doesn't mean you can't enjoy your love of sport. You will find Sportsplex 55 kilometres (33 miles) to the southwest of Neepawa. Sports fans wanting to find accommodation close by can make a choice from the Victoria Inn Hotel & Convention Centre Brandon or the Comfort Inn Brandon. Located 160 kilometres (101 miles) from Neepawa is Winnipeg International Airport. Stay nearby at Four Points by Sheraton Winnipeg International Airport or Clarion Hotel & Suites. 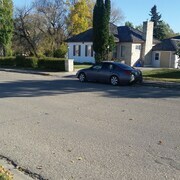 Are there hotels in other cities near Neepawa? What other types of accommodations are available in Neepawa? Explore Neepawa with Expedia.ca’s Travel Guides to find the best flights, cars, holiday packages and more!